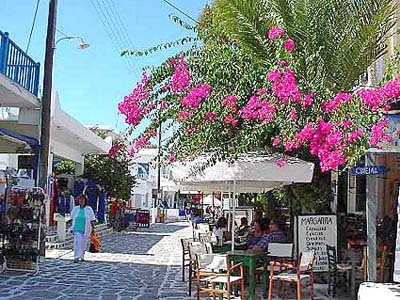 Since the morning breeze is mild, we decide to visit the nearby island of Anti­paros. Wind can be an important consideration in such matters. Because the ferry that plies the channel between Paros and Anti­paros is small and flat-bottomed, high winds assure a bumpy passage. We drive to the landing at Pounda, leave the car in the parking lot, and wait for the ferry to return to Paros. The crossing, which is less than a kilometer, takes only about ten minutes – and we can see the ferry has already left the Antiparos dock. When it lands and offloads a few cars and passengers, we board and stand at railing, where we can enjoy the sights. The trip is almost too quick. After looking up and down the channel, we find the domed church and windmill at ferry dock suddenly in front of us. Within a few more minutes, we are walking along the quay in Antiparos town, which is also called Kastro (which means castle). 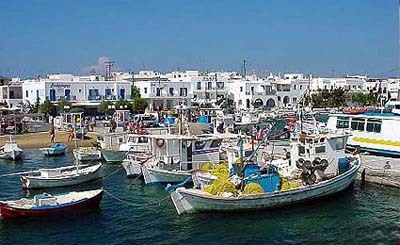 Walking around the shallow harbor, crowded with boats already returned from predawn fishing, we begin to wonder about the castle of Antiparos. We have not seen it during our several trips to this island, so we decide to find it. After getting some general directions from a local merchant (“take the alley from the platia at Ayios Nikolaos“), we set off in search of the castle. There aren’t that many streets in the town, but they do have turns and twists that can be confusing. We walk around in circles several times before we stop in a small platia with a small church on the corner and several unpopulated cafes. There is no castle in sight. We ask a waiter for directions to the kastro, and he laughs. “Right behind you,” he says, pointing at the church. We had deceived ourselves, because we knew Ayios Nikolaos (built in 1783) was the metropolis (or city church) – the most important church on the island. We assumed that implied large. This little church is smaller than the one at the ferry dock. 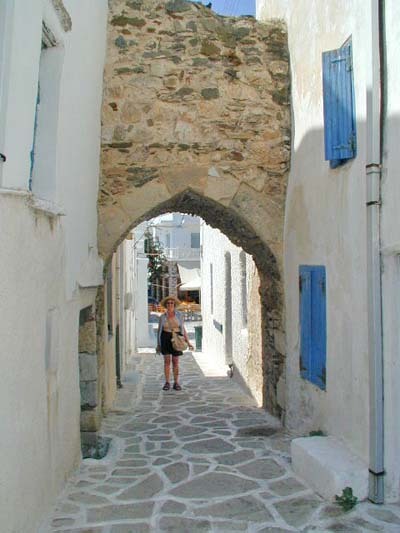 We walk to the entrance of the church and turn left down an alley towards a stone archway. 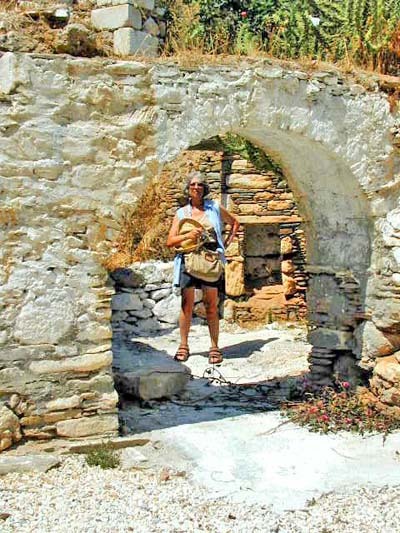 Next to the arch is a sign that explains the design of the Anti­paros castle. 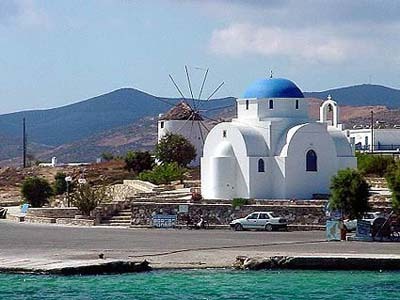 It was built in the 15th century by Leonardo Loredano, a Venetian nobleman who acquired the island as a dowry when he married the daughter of the Venetian ruler of Paros. 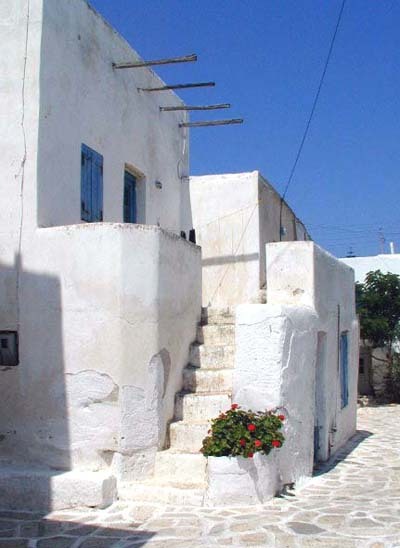 No one lived on Anti­paros at that time, so Loredano imported Parian farmers to cultivate the fertile areas. Because pirates frequently raided the islands, Loredano thought it wise to build a fortress. Maybe Loredano was trying to save money, or perhaps he was just being practical about building a new town. 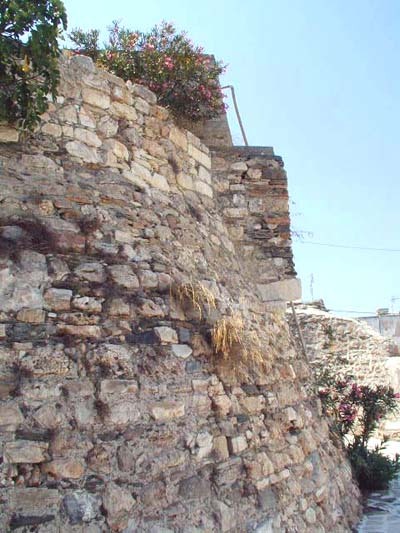 The castle of Anti­paros was built as a rectangle of houses with their outer walls forming the stone bulwark. Within this enclosure was a courtyard occupied by a massive stone tower, which served as the residence of the ruler’s family. People still live in the houses that form the fortress walls, and the neighborhood offers a rare example of 15th century urban planning. However, only the base of the stone tower remains in the courtyard. It probably came down in 1537, when the pirate Barbarossa conquered the island. We walk around the neighborhood, which is very attractive in many ways, but there is little of the tower itself to explore. 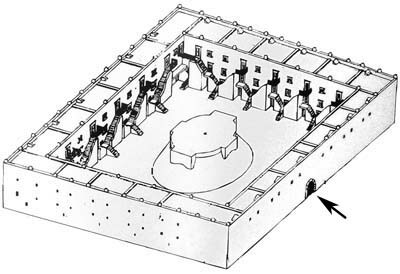 I find a section on the ground level of the tower that appears to be a kitchen facility. It is certainly large enough to serve the Venetian folk in the tower (kitchens in Greek houses tend to be quite small). I also find the remains of a large furnos (oven), which would not be seen in a Greek home – even in modern times. After leaving the castle compound, we explore surrounding neighborhoods built centuries after the castle. Wandering through narrow lanes between whitewashed houses decorated with geraniums and draped with beautiful bougainvillea and jasmine vines, I honestly cannot tell the difference between newer homes and those built 600 years ago to create a castle.